The usual readers of this blog would know really well that I´m a maniac lover of Bong Joon-Ho´s filmography. Not only do I think that the korean director is one of the most underrated filmmakers of this new century, but he´s been able to prove with only a handful of excellent films his skill in mixing genres, making their stories feel scattered but strangely organic. So, when his new adventure film (second in english) arrived to Netflix after two years of waiting and a ridiculous controversy in his debut in Cannes because of the conflict between the streaming service and the supporters of french cinema distribution, I was ready for it, willing to be amazed once one. I was certain that I will be particularly subjective in this case, because Bong gains me easily, but I was willing to watch the movie with inquisitive eyes. Now I can guarantee that this would be one of the most interesting films of the years. It´s for sure Bong´s weakest, and an irregular story that loses his focus after the first hour, but his plot, themes and visual flare make it a rather recommendable movie. The Mirando Corporation, leaded by Lucy Mirando (a once again extravagant Tilda Swinton), create a new genetically modified species, the super pig, and disperse the best twenty-six in twenty six countries so that, after ten years of growing up, the winner of the best super pig contest will travel to New York to participate in a great, festive event. 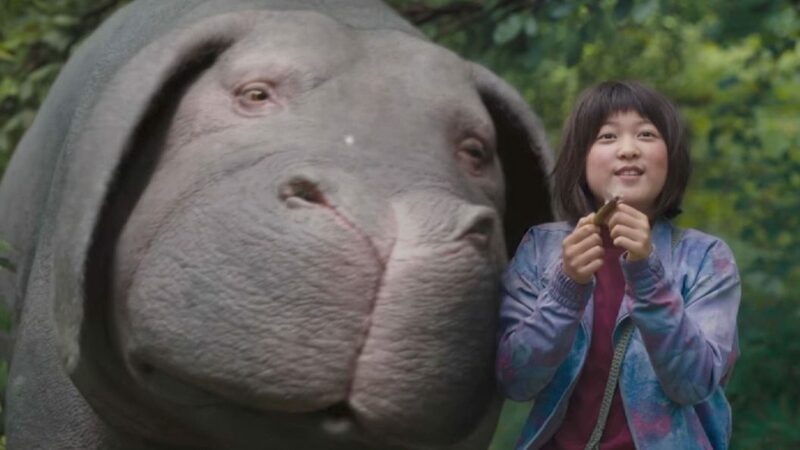 But when Johnny Wilcox (Jake Gyllenhaal, completely over the top) and other Mirando workers travel to South Korea to take the enormous Okja from the country girl Mija (a great Ahn Seo-Hyun), she will do everything she can to save her friend from the hands of the evil corporations. An adventure movie filled with tenderness, ecologism, satire and capitalism tenebrism. An action story full of histrionic characters and lucid critics to food business, complete with some activism parody. First of all, this is a great movie from a visual perspective, it may even be Bong´s most beautiful; Darius Khondji´s work really shines here. Jaeil Jung also composes some great melodies, and Bong direction manages to create a great flowing rythm of storytelling and craft some exciting sequences. His extensive gallery of freaky characters give the movie a varied sense of fun and dynamism that suits well the light tone with some deep and dark reflections around animal treatment. A shifting and heterogeneus product with a lot of achievements, both thematically and filmcraftingly. A movie with the most important thing: a heart and soul, and some worries to share. As anyone could guess, all these narrative tones don´t match really well, particularly the grotesque one, which really worked in Snowpiercer . They don´t add to the ecological message, and in the case of Gyllenhaal, it turns out to be even ridiculous. The childish point of view of some the aspects of the villains decription lessens the capitalist critic, and once Mija is in New York and we meet Paul Dano and his Animal Liberation Front, the films becomes reiterative and disorganized. 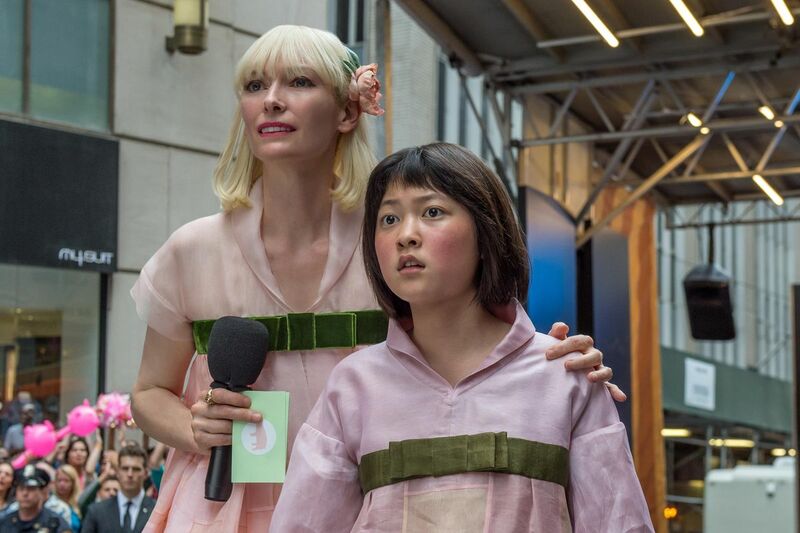 The main focus is put on the extravagance, and is the action and the tender relation between the amazing Okja and the brave Mija what really works, and it gets lost in the mix. Anyway, being an irregular movie doesn´t avoid it being a very good one, which a lot of signs of the master behind it.